Super Savings Item! Free Shipping Included! Save 37% on the Venus Induction Capable Espresso Coffee Maker, Stainless Steel, 4 cup by Bialetti at Jakis Cafe. MPN: 06968. Hurry! Limited time offer. Offer valid only while supplies last. For those preferring a smoother coffee taste, the Bialetti 4-Cup Venus combines beauty and elegance in a tastefully designed stovetop espresso maker. For those preferring a smoother coffee taste, the Bialetti 4-Cup Venus combines beauty and elegance in a tastefully designed stovetop espresso maker. Bialetti's legacy of quality and reliability lives on in this coffee maker crafted in high-quality 18/10 stainless steel (including the inner parts such as funnel & filter plate) with ergonomic, heat-resistant handle and lid. 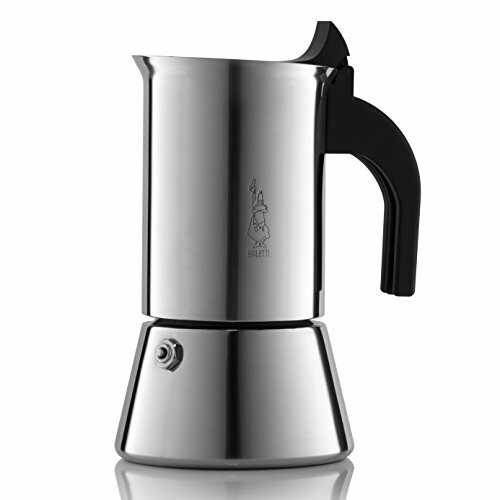 Produces 4 cups of rich, authentic Italian espresso in just 4-5 minutes. Note that max boiler capacity is slightly greater than the final output. Some water will be left in the boiler after brewing. The Venus is compatible with all stovetops, including induction cooktops. Stainless steel espresso pots are not dishwasher safe, hand wash only. Never use other contents besides coffee like teas, cacao powder, instant coffee or fine ground coffee as it will clog the filter plate. To use; fill the lower chamber with cold water just below the valve. Insert the funnel and fill it with ground espresso (do not tamp). Remove any coffee grounds on the edge of the funnel. Tightly screw the upper part of the pot on the base. Avoid using the handle for leverage. Select burner size to fit the bottom of pot. For gas stovetop, make sure the flame is not larger than bottom of pot. The flame should not come around the sides of the pot. Place pot on the stovetop until the water boils and coffee begins to come out of the center post. There will be a gurgling sound during this process. When the top of the pot is full of coffee, remove from stove. Hazel brown foam appears just seconds before the coffee is completely done. Before pouring coffee, stir it in the upper chamber with a small spoon to equalize all the different coffee layers for optimum flavor. Bialetti is the world's most recognized and beloved Italian coffee company. Bialetti coffee makers have become iconic and has allowed millions of consumers to enjoy great Italian coffee that once was only available in cafes and restaurants. Bialetti's passion remains in making superb coffee simple. Makes 4 Espresso Cups = 8.0 fl. Oz.